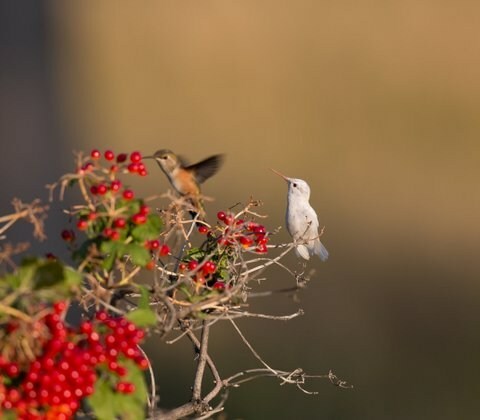 The hummingbird was pure white in its plumage, bill was pinkish, feet/toes were pinkish; tongue appeared whitish; eye in photographs is red/pink. The bird appeared rather large or among the larger HBs that came to my feeders. The shape of its body silhouette, bill, slope of its head/shoulders/bill appeared to be consistent with a broad-tailed or rufous HB. Both rufous and broad-tailed are the dominant HBs at my feeders during mid-July through mid-September every year. 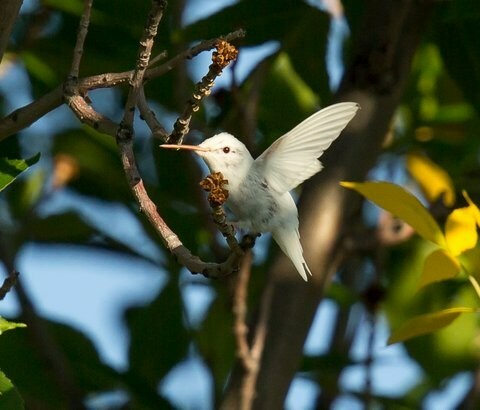 The shape of its flared tail (see photos) appears broader and rounder, and the individual tail feathers appear more rounded than pointed or notched as depicted in the Sibley’s guide for rufous HBs. The bird appeared strong and vigorous in its flight and in its feeding behavior. On Monday August 19, 2013, after seeing it at approx. 6:45 a.m., it came to the feeders every 30-45 minutes all day long (I worked at home that day with a good view of the feeders), then would often retire to the interior of one of two ash trees that are situated about 10-20 meters away from the feeders – in opposite directions. 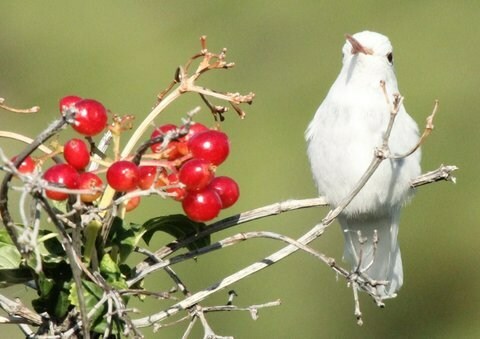 It would sometimes perch on a bare branch of a cranberry shrub (I think our shrubs are viburnum opulus nana) located about 10-15 feet from the feeders. Sometimes it left for other parts of my yard or elsewhere. It fed actively from my feeders and visited other plants/shrubs in my yard, but I did not notice specific flowers it visited. It fed from my neighbor’s gladiolas on at least two occasions. When perched near the feeders especially, it seemed awake, alert, moving its head sometimes (but not continuously like rufous seem to do) to watch its surroundings. 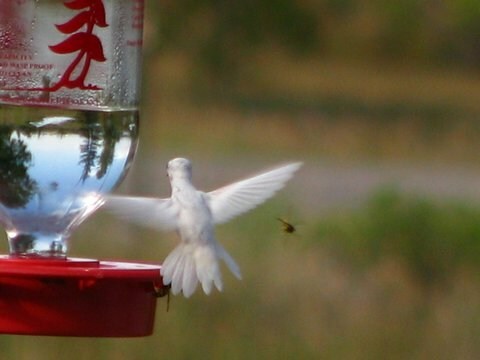 At one point, at least 4 other HBs flew in to the feeders when the albino HB was there; and the albino was not chased away – it appeared to hold its ground. On Monday late afternoon & early evening, it was more frequently at the feeders, actively “guarding” the feeders, sometimes chasing other HBs away. It exhibited the active “guarding” behavior only once in the two days I watched it. 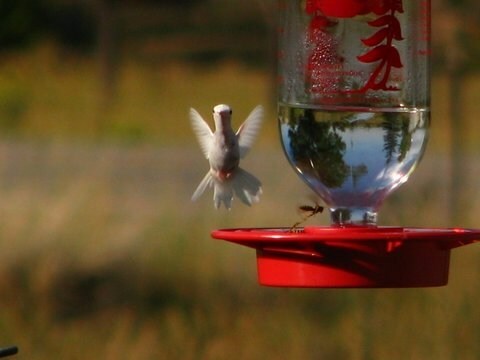 I saw the bird interact only with subadult or juvenile rufous or broad-tailed hummingbirds, no adult male rufous or broad-tailed HBs visited my feeders during the albino’s stay, at least not that I observed. I saw the bird as early as 6:45 the first morning, and as late as 7:45 on the evening of the second day. I saw the bird on 7:15 a.m. Wednesday morning (August 21st) and not thereafter. Birders and photographers came later that day and the next day or two to look for the bird, but it was not seen again by anyone at my house or by my two neighbors to the south. The general over-all behavior seemed consistent with broad-tailed, as compared to the more feisty/aggressive rufous. 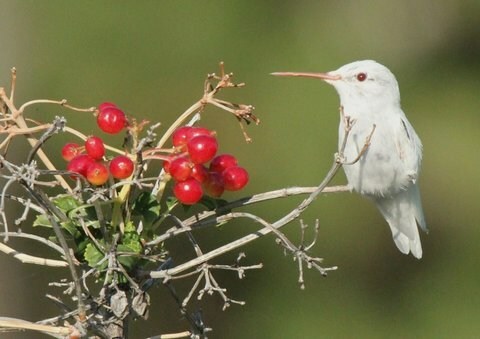 Ron Harden believes the bird was an adult broad-tailed HB. See previous notes. I distinguished the bird from rufous hummingbird due to the shape of its tail feathers primarily, and its behavior was not quite as aggressive as rufuous HB. 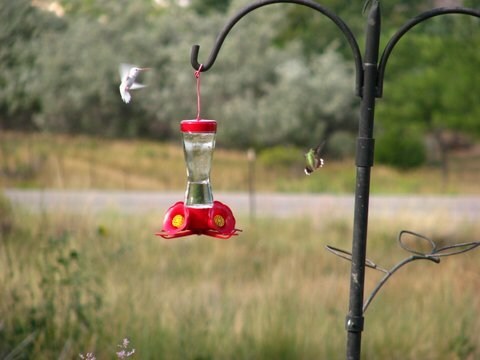 Many broad-tailed and rufous hummingbirds frequent my feeders and plants mid-July through mid-September every year. Occasionally we get calliope and black-chinned, but mostly broad-tailed and rufous.